Like the title suggest, socialcam is the new videosharing app which functions just like instagram but it shares video!I liked the idea mainly cause you can now post/upload/share casual video (YT community doesnt really cater to that base). I first created this last year cause many of the popular Instagram user I follow has it and I just want to view their vids , oh yeah I sound like a creepy one..
And to avoid socialcam to send push notifications to your facebook (it’ll broadcast every video you view/likes/comment), I sign up by email and turn the sharing off. Cause trust me, I have seen some of the spam socialcam made on facebook and I think the user wasnt even aware their activity was published like that. Other than that, its an awesome app and I’m gonna make more of casual videos in the futuree so watch out for it ! 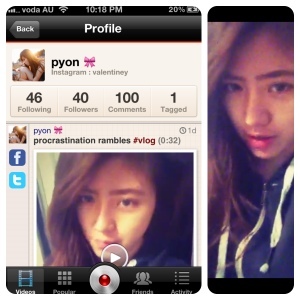 Categories: Blog, Friends, Socialcam, Vlogs | Permalink.